Um, yeah, saying things are not looking good for the multibillion-dollar Large Hadron Collider is a huge understatement. Four years ago, the scientists at CERN and their Large Hadron Collider had a fantastic first run that resulted in the discovery of the long-sought-after Higgs boson particle. 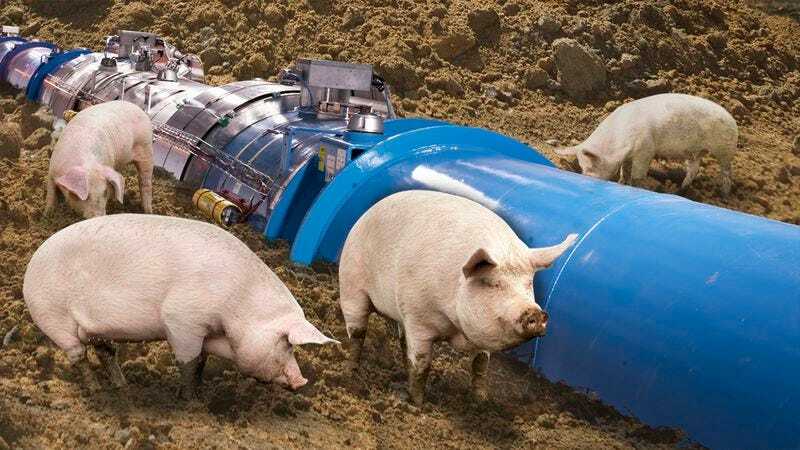 But now, all major scientific breakthroughs have been put on hold until CERN can figure out how to get a group of wild pigs to stop digging up the 17-mile-long LHC. If you have any interest in cutting-edge science research, you know just how significant this setback is. CERN had barely warmed up the Large Hadron Collider for its second official run before scientists became aware of a massive malfunction. Engineers who made their way through the underground tunnels to fix the faulty area were shocked to discover sunlight streaming in from a 300-foot hole with a handful of wild pigs rooting around the 28-foot-wide steel tube they had just dug up. Since then, the pigs have burrowed their way into virtually every part of the facility where they’ve subsequently caused millions of dollars’ worth of damage as they chew through countless wires and rub against important equipment and diagnostic tools. Scientists who had long awaited their turn to work with the LHC are being forced to spend their limited time banging pots and pans to try and scare away the wild pigs that never seem to tire of digging up the massive superconducting magnets that accelerate protons to nearly the speed of light. It’s anyone’s guess when the scientists will be able to solve the hog problem and get their particle physics experiments back online. Ugh, what a mess. So far the Large Hadron Collider’s second run has been a huge letdown. Hopefully CERN’s idea to spray the ground above the LHC with wolf urine works, because right now the whole thing is essentially just a multibillion-dollar paperweight.